﻿Con﻿tinuing on from last post, the graph above shows loans disbursed by the banking sector for residential properties and credit cards, with credit cards totally trouncing residential property loans after 2005. Are we afraid that this graph shows that current credit conditions might spawn mass bankruptcies, especially since it seems that consumers seem to opt for non-durable goods rather than investment assets? Not all doom and gloom, however :) . Non performing loans for residential property loans are substantially higher (i.e. 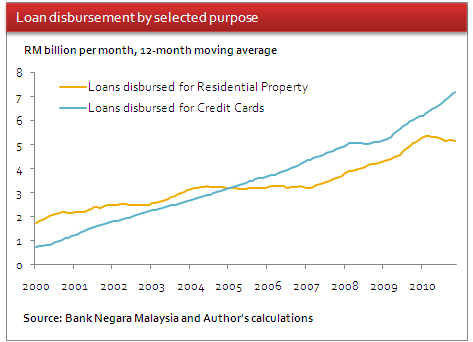 nearly RM8 billion vs RM0.5 billion to credit cards). Besides, Malaysia's approaching - or at least a lot of policy makers are encouraging it - a cashless society. Also, not a lot of people fall very far behind in their credit card bills, lest they want to incur some ridiculous interest rate. As of January this year, only 10% of the outstanding credit card balances are overdue.